From time to time, there appears among men a figure who embodies the best, or the worst, that men can show. These individuals become the most loved or the most hated of men. In either case, they usually draw to themselves many followers or devotees. Such figures have enormous magnetic appeal for the majority of men or, on occasion, are an inspiring example of destructive power on a large scale. The history books are full of examples of both types. Today, in large numbers, many examples of both types are manifesting worldwide. The effect of this manifestation is to set before humanity two opposing lines of action, and so create the tension of choice which will determine the future of the race. In biblical terms this is the ‘Sword of Cleavage’. For many years the energies emanating from, and directed by Maitreya have sought to create such confrontation of opposites. This may seem strange indeed to many people but it is essential that humanity make the correct choices for its future. Otherwise that future would be bleak indeed. The Sword of Cleavage is the energy we call Love: wielded by Maitreya it sets “brother against brother” and tests the true divine consciousness of men everywhere. The ultimate aim of all evolution is to establish on Earth the ‘Kingdom of God’, and the Sword of Cleavage shows men the way. The teaching of Maitreya is simple. One might think that His priorities would seem obvious to all men; sadly this is not the case. Maitreya presents a future of tranquillity and peaceful endeavour as the inevitable result of sharing and justice for all, the creation of a world “where no man lacks, where no two days are alike, where the Joy of Brotherhood manifests through all men”. How is it possible, you might think, to gainsay such a message of hope? Is this not the future yearned for by everyone? It is the future hoped for by the majority of men, but not by all. Humanity stands on different rungs of the evolutionary ladder; above a certain level all bodes well for men. It is those who have not as yet manifested that measure of their divine Self who do not recognize that sharing is divine, that justice and right relationship are divine, but who see Divinity as competition and conflict, and register a man’s worth by the weight of his gold. Many are fearful and suffering; bereft of work and hope for the future, they struggle from day to day. But many others are making their future for themselves, and many, too, are dying in the process. Throughout the world men are awakening to the possibility of a better life with freedom and justice at its heart. Have no fear, the people’s voice is rising and like a contagion affecting more and more. Maitreya stands behind those who live – and die – for the truth of freedom, justice and the unity of man. The young lead the way, and the future is for them. Q. I read that Maitreya, your Master and you yourself think that commercialization is destructive. Why? The world has always traded. What’s so wrong with commercialization? A. There is a difference between ‘commerce’, for example, trading, and the effect of commercialization. Trading is a legitimate way of exchanging goods and, as you say, has been carried out for untold ages. Commercialization is a situation in which making money (profit) enters every possible field of human activity. Even the provision of healthcare and education becomes subject to this gross materialism. Today, commercialization knows no bounds and cannot be contained. Every service is considered as a commodity, which can be bought and sold, at will. This degrading practice is at the heart of our problems today. Q. (1) Should Colonel Gaddafi and his sons be charged with ‘crimes against humanity’ or given asylum somewhere? (2) If asylum, what message does that send to other dictators? A. (1) I would vote for asylum. If Gaddafi and his sons were charged in a world court they (or their followers) would become martyrs. It is better that the memory of their misdeeds and policies of terror are not allowed to be glorified but are quickly superseded, forgotten and forgiven. It should not be forgotten that there are still neo-Nazi groups in Germany and elsewhere. (2) I do not think that asylum would give encouragement to existing dictators. The removal from power is for them sufficient loss. The thought of asylum could even encourage them to go. Q. Is boycotting the products of countries, eg Israel, really effective? Do boycotts not always harm the poorer people in a country? A. It depends on the country. Boycotting is a way for the international community to demonstrate its disapproval of unlawful practices. It is rather a blunt instrument and, depending on the kind of boycott, can affect rich or poor or all citizens of the boycotted countries. Q. It is clear that Maitreya and the Masters encourage people power – I see reading Share International. But do They condone mindless violence and destruction such as seen recently in England? A. “Mindless violence and destruction” is not a demonstration of people power but of destructive power. Hierarchy would never encourage or condone violence or destruction. Q. If a person were to ask Maitreya and your Master by Their Grace to expand and vivify their heart chakra so that they became more empathetic and better able to serve others, do you think Maitreya and the Masters would help? A. Maitreya and the Masters release Their energy and love unceasingly. Those who are sensitive enough and whose heart response is adequate are being helped whether they are aware of it or not. Q. What is the real esoteric effect of great music – such as that of Mozart, Beethoven and Bach? Is there some sort of energetic phenomenon at work? What’s the mechanism that lifts the spirits, touches the heart and so on? A. We live in a divine universe; all people, at their highest level are divine. The inspiring effect of great music from Bach, Beethoven and Mozart etc, is a dim reflection of that creative Divinity with which we are essentially at one. All great art is a reflection of that divine resonance. Q. I read in so many places that the US and Germany, possibly other countries, have perfected anti-gravity ships. That many of the so-called flying saucers we see are actually these various shaped craft of domestic origin and are (in the US at least) paid for by the research done with taxpayer money to a division of the military called Black Ops. What is your take on that? A. It is true that American, Russian and probably other governments have achieved a demonstration of ‘anti-gravity’. Some have also created vehicles which use this anti-gravity function, but nowhere has been achieved the complete control of space, appearing and disappearing at will, travelling at momentous speeds etc, as is demonstrated by our Space Brothers. These functions are only possible by the Space Brothers because the vehicles are not made of what we call solid physical matter. They are made of etheric matter and it will take our present governments many years into the future to make such craft. Q. (1) For a personal meditation can a person simply focus on the ajna center and sound the inward OM without using The Great Invocation? (2) Would that be more of a scientific way of meditating than some other forms of meditation? A. (1) Yes, of course, but it would not be that science of Transmission Meditation. For the purpose of doing Transmission Meditation (a group meditation) the Great Invocation is used to invoke the energies from Hierarchy which the Masters then transmit through the groups, using the science of triangulation. (2) No. Q. Is it possible that the body be kept alive artificially against the will of the soul? A. Yes, ‘alive’ in the sense of the organs still functioning, but not ‘alive’ in the true sense, if the will of the soul is not involved. Q. Is the whole process of dying easier for people practising Transmission Meditation for, say, more than 10 years? A. It depends; it is impossible to give a straight ‘yes’ or ‘no’ answer to this question. It is certainly not the function of Transmission Meditation to make death easier. Q. How evolved does someone have to be in order to be able to will themselves to die – if they know their physical situation is hopeless, for instance? A. It should be possible for those having taken the second to third initiation. Q. Is soul contact and hence conscious dying impeded when the dying person takes morphine or other anaesthetics or painkillers? Q. How can people who have died help their relatives and others on earth? A. They can, but it is difficult to describe the process; by telepathy is probably the closest to describing it. Q. (1) Is Raphael in the book From the Mundane to the Magnificent by Vera Stanley Alder a Master of Wisdom? (2) Was he a disciple of a Master working on the inner planes? Q. Benjamin Creme has stated that the avatar Sai Baba did not come from our solar system, so I wondered if He may have been an avatar from Sirius? Since Benjamin Creme has also said that Sirius is the second most evolved star in our universe I thought that this might be a likely origin for Sai Baba. Is my intuition correct? If not, can you reveal where Sai Baba came from in our galaxy or universe? A. I’m not aware that I have said either of these statements. However, Sai Baba has said that “no-one can know my origin”, so do not expect me to let Him down! Q. There are a lot of people with alleged gifts of contacting the spirit world and or people that we are related to or have known. How do we know if they are real? They charge a lot of money and I should imagine some are less than charitable knowing their clients are very vulnerable. A. You are quite right. There is an enormous glamour connected with this branch of psychism, especially if money is involved. Q. I read your books and I am interested in healing. I found out that the astral aspect is a main factor in doing healing work correctly. Because I don’t want to make a mistake, I have two questions. At which point of evolution can one be sure to transmit more soul energy than astral energy to the patient’s need? At which point of evolution can one invoke the healing energy of a Master to transmit this power selflessly on to the patient? A. To be sure that self-deception is not involved in large measure, I would say that anyone giving healing from the soul level needs to have taken the second initiation. Q. (1) I read in Share International that some ‘human avatars’ can have a negative influence. Could you please define the word ‘avatar’? (2) Does being an avatar have something to do with the person’s soul destiny? (3) Does it mean that they act as conduits for certain energies which ordinary people could not do? A. (1) Yes, they can sometimes have a negative effect. An Avatar is someone who has come from ‘above’, that is from a higher state or a higher planet for the benefit of humanity. Avatars can be from cosmic, planetary or simply human levels. (2) Yes. (3) Yes, usually. Q. (1) What does it mean to be a Swami? (2) Are Swamis trained to work ‘supra-materially’, i.e. are they trained, for example, to materialize objects? (3) Does being able to materialize objects automatically indicate that someone is highly evolved? A. (1) A Swami is someone who has followed a particular line of spiritual teaching and development usually stretching back to very prominent teachers of the past. ‘Swami’ is a Hindu concept. (2) Not necessarily. (3) Not necessarily. I heard an incredibly moving story while listening to Beyond Belief, a programme broadcast on BBC Radio 4 on 12 September 2011, exploring theological responses to 9/11. The presenter interviewed a woman who described an experience she had on a New York subway carriage soon after the 9/11 attacks. She felt something was wrong as soon as she entered because of the “immense tension in the air” and described how all the passengers were bunched up on one bench. All except for one man who sat opposite, an “ancient, wizened Sikh, sitting very tall and straight.” The interviewee described how the man had “tears streaming down his face” because of the “intense hatred” directed at him by the other passengers. She went across and sat with him, trying not to look at the passengers opposite, and then he did the “most remarkable thing”. He got up and walked to stand next to a Hispanic mother who was standing with her baby. The interviewee watched how everybody flinched, but the man pulled from his pocket a crumpled dollar bill and tucked it into the baby’s fist. The doors opened and the Sikh walked out; as the doors closed again everybody in the carriage suddenly burst into tears. Describing this story the interviewee felt she had been shown “what we were going to need to do on a huge scale” to transform the energy of hatred following the attacks. I have never seen Maitreya’s ‘star’ though I look for it every night. I never heard Maitreya on the TV or radio, but in 1960 I lived in a private home with three other renters. One night before going to bed I went to the bathroom. There I saw a large cross in the window; I called the landlady and other renters to come and see the cross. Everyone saw it and was overtaken with surprise. It was there for three evenings. As a metaphysical student I knew that it heralded an Event to come. That same year on a lovely summer day I was in the backyard when I looked up to the sky and I saw a golden city with turrets on the houses and a gold wall surrounding the city. Then I saw figures in golden attire walking along the wall. It was visible for a few minutes then it dissolved. A few days later a teacher friend of mine called me; she said you won’t believe what I saw. I interrupted her saying a golden city in the sky; she said oh you saw it, my son saw it too. I said yes, no matter what happens the Earth is protected by higher beings. I just hope Obama will listen to Maitreya. This happened in Cleveland, Ohio. G.B., Santa Cruz, California, USA. I was helping at the book table at the recent February 2011 Emergence conference in Barcelona when a middle-aged woman dressed in a traditional and classical style approached the table and began looking at the books. After a few minutes, she came up and asked me: “What is the relationship between Transmission Meditation and the Emergence of Maitreya and the Masters of Wisdom?” I remember that I was struck by her piercing gaze and very blue eyes. Although now I cannot remember clearly what I said to her, at the time it seemed to me that my answer was quite coherent, and I was surprised at being able to respond in such a way. I think I said that Transmission Meditation is what connects all the Emergence workers in the world, and connects us with the Masters. Transmission Meditation strengthens our connection with Them and with each other. We are One, one group. The Emergence is not only the Emergence of the Masters and Maitreya, but also of the entire Spiritual Hierarchy. Transmission Meditation empowers us in our service work of making the Emergence story known. While I spoke, she watched me with a very piercing and intense gaze, which rather surprised me as it didn’t fit in with her appearance of a ‘sweet little old lady’. She seemed satisfied with my answer, looked me directly in the eyes and thanked me, and left the table. Who was this lady? I was leaving a bookstore in the central region of São Paulo, a very well known avenue called Avenida Paulista. I had bought the book A Treatise on Cosmic Fire by Alice Bailey, and was very happy because I had wanted for some time to buy that book. So, when I was out of the bookstore, I looked for a bench to sit and read. When I sat on the bench, and began to read, two police officers passed by me. One began to look at one of the volumes of the book that I left at my side. First, I thought that maybe he was going to tell me to remove it from the bench because, when I looked at it, I realized that it was occupying a seat that could be used by other people. But then, the police officer pointed to the book and, with a smile, said to me: “This a good book! A good book!” I was very surprised, because the police officer looked very calm, a little happy, and his smile was full of joy. He then left, with the other officer. Was this police officer and his colleague someone special? If not, I was very surprised to see that he had such a good opinion of the book. Does this mean that people are more open now to esoteric teaching than they were in the past? I would like to share an experience which happened to me around 8.30am on a December morning in 2000. I was a student at The University of Tilburg (the Netherlands) and I had an exam on that day for which I was already late. I was daydreaming a bit and therefore was not paying that much attention to the fact that the wheel of my bike was standing on the road where the cars were driving by. Suddenly my front wheel was hit hard by a car. It hit me so hard that I was thrown into the air several metres, flying over the car. That’s what people around me told me later. The strange thing was that the moment I was hit by it, I felt completely safe, protected and peaceful. It was as if I was put into a bubble of love and peace. I escaped the accident unharmed. After it happened I also was completely calm and not worried by it at all. Did I receive any kind of protection at that moment? If so, by whom? M.V., Breda, Noord-Brabant, the Netherlands. On 15 April 2011 I was painting my flat. I was in a hurry to finish as soon as possible because I was planning to go on a trip to Israel in a few days. Without holding the ladder, with tools in both my hands I stepped on the ladder. When I stepped on the third rung, the ladder turned over and I fell down flat, just avoiding the furniture. It is almost unbelievable that I didn’t hurt myself. I could have cut my chest, broken my neck or at least sprained my knee. All I got was a few bruises. Even the slightest injury could have prevented my trip. I felt as if someone held me in the air for a moment and then put me down. I would like to ask you if a Master helped me? We present a selection of quotations on the theme of ‘The Sword of Cleavage’ from Maitreya (Messages from Maitreya the Christ, and Maitreya’s Teachings – The Laws of Life), Benjamin Creme’s Master (A Master Speaks), and Benjamin Creme’s writings. When Maitreya comes before the world there will begin for men a period of intense heart-searching and reflection. It is only to be expected that for many it will be a painful, even traumatic, one. So steeped in the ways and ideas of the past, so fearful of a future unknown and strange, are millions today, that men will want to take stock of the new situation which will then pertain…. When Maitreya first announces His plans and hopes for the rehabilitation of the world, His energy of Love – the Sword of Cleavage – will further delineate the divisions which now exist. Men will take sides – for or against the new principles that He will present for the betterment of all. Thus will it be. Thus will a period of discord and discontent precede the acceptance of the new. Gradually, however, even the least sanguine will acknowledge the need for a reconstructed world and add their weight to the task. The world has come to a point not only of no return but of total crisis, total confrontation between good and ill, between that which produces harmony and that which produces the opposite. This is the result of the energy of the Sword of Cleavage. In the Christian Bible we read that Jesus said: “The father shall be divided against the son, and the son against his brother,” and so on, all very destructive. The Sword of Cleavage is, ironically it may seem, the energy of Love. That is what has been happening and is happening today, and will be focused to a fine point by Maitreya. The Sword of Cleavage is really the energy of love. The energy of love is the sword which creates cleavage in the world. Cleavage is difference, separation, and yet, when we understand it, that energy is released to the world by Maitreya Who is the Avatar of Love. He releases that love in the world and it stimulates everybody without exception, the good, the bad, the altruistic, the selfish, the greedy, the unselfish, and so on. Everybody is stimulated. The energy itself is purely impersonal, it is neither good nor bad. It is an energy which stimulates, it brings together all peoples, and even the particles of matter which hold the world together. The particles of matter in our body are held together by that same energy. It is God the Son, the Christ aspect, the Consciousness aspect. That energy of love holds and binds together the particles of matter without which there would be no world, and when it is released in a mass way, as it has been for many years, it creates the Sword of Cleavage. Love is totally impersonal. That is why it is called the ‘Sword of Cleavage’. It divides by the fact that people respond to this impersonal energy in whatever way they are motivated. If they are motivated by good, desire for the best for all humanity, they will take that aspect and act on it. If their motive is ‘evil’, for want of a better word, if it is separative, non-inclusive, they will take that same energy of love and be galvanized in the opposite direction. So it stimulates everything, the good and the bad, the selfish and the altruistic. That is why Maitreya has to be very careful with it, very skillful, to make sure that the right reaction is uppermost. Maitreya knows that when He steps forward into the world arena a mixed reception will be forthcoming from humanity. There are many who look forward to that moment with joyful expectation, who will see it as the beginning of the New Time which awaits the sons of men. There are others, however, understanding little of the meaning and process of His advent, who will look askance and doubt His credentials, fearfully aware of scriptural warnings which they all too readily misinterpret. Others, too, will simply watch from the sidelines, awaiting a lead from those they hold in some esteem. Thus will humanity range themselves on one side or the other: those who welcome the Teacher with open arms, eager to follow His precepts and advice; and those who see Him as the embodiment of evil and all that they distrust. The energy of love is absolutely neutral. It is neither ‘good’ nor ‘bad’. We think of love as being all good. It is neutral. It is the ‘Sword of Cleavage’ which is used by the Christ deliberately to stimulate all Beings. It stimulates the good and the bad. It stimulates the selfish and greedy, and at the same time the altruism of others. It creates a line down the middle so humanity can see where it has to stand, with no blurred edges, just where is the good and where is the evil, where the greed and where the true soul altruism. “Imam Mahdi Unexpected Appearance” proclaims the title of a video posted on YouTube. 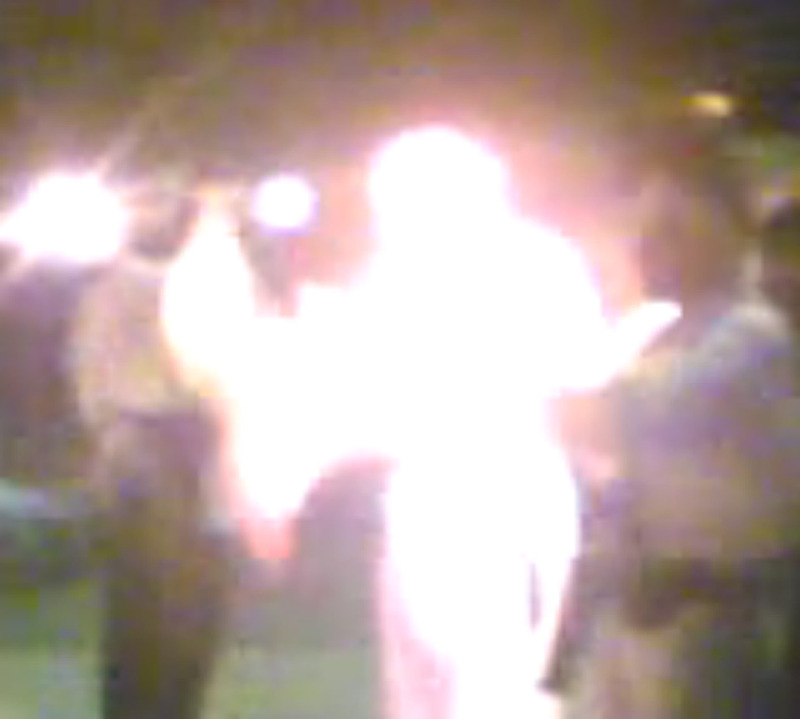 A miraculous figure of glowing, brilliant, white light appeared on a video filmed in Karbala, Iraq, on the night of Ashura, 6 January 2008. This Shia Muslim ceremony commemorates the martyrdom of the grandson of the Prophet, Hussein, whose tomb is in Karbala. This year, 2011, has seen increasing numbers of UFOs reported all over the world, including some extraordinary mass sightings. Media are reporting the phenomenon more seriously and many governments are gradually releasing their secret UFO documents. With video-making technology now available to the masses – mobile phones and video cameras – the people are leading the way in filming UFO sightings and posting them on the internet. This new development has allowed people to broadcast their films to a huge audience, and has encouraged more media channels to report and investigate the sightings. 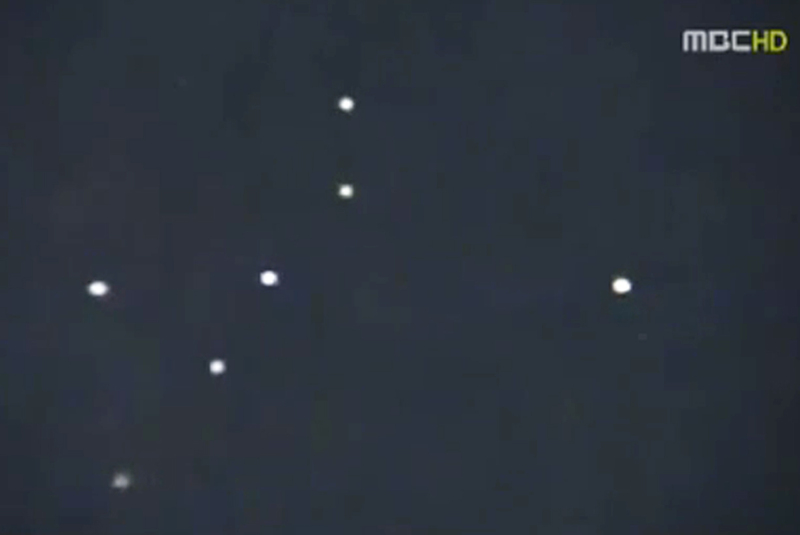 A vast group of UFOs was filmed and posted on YouTube by ‘njorgensen1154’, who was in his pool when he saw “thousands of these things in the sky, just sitting there”, flying very high, northwards over Carmichael, near Sacramento, California, at around 7pm local time on 13 August 2011. 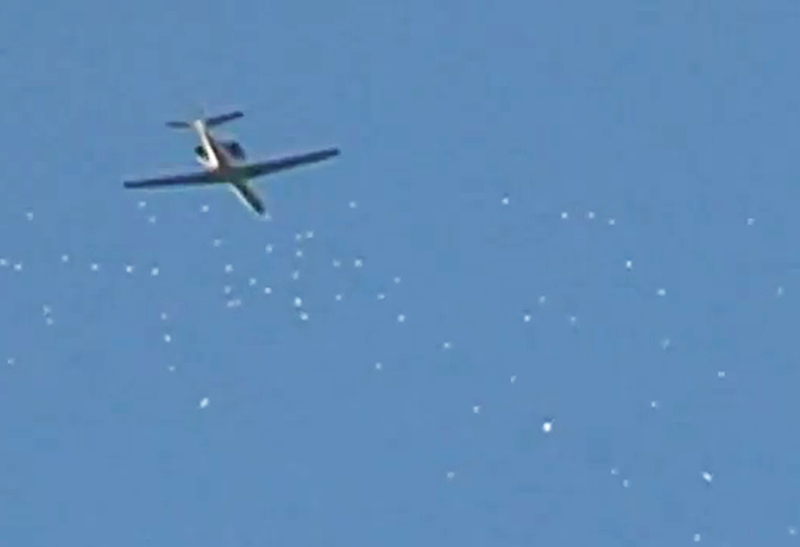 He filmed the “white orbs” for about 15 minutes, until they finally moved out of range of his camcorder. 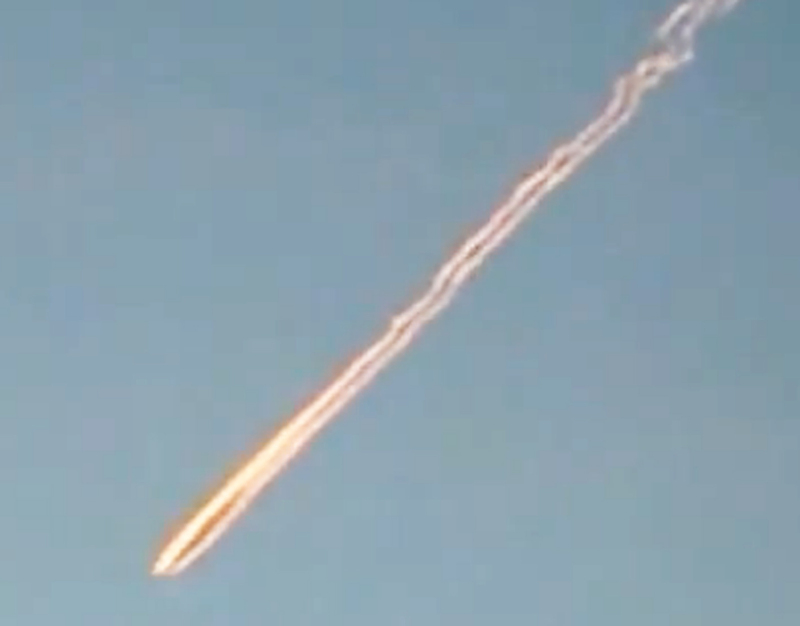 The MBC news coverage included Professor Maeng Seong-ryeol, professor at Woosuk University and president of the Korean UFO Research Center, who said that this was probably the first time that this type of bright, moving UFO had been captured on camera in Korea. “Given the brightness of the objects, taken by a mobile phone, they are highly likely to be the sightings of UFOs,” said UFO investigator Seo Jong-han. “It is almost impossible for flying lamps to be as bright as that at night, as some people suspect.” A phone call to the news desk from a Korean Air Force spokesperson confirmed that there were no flights at the time, and nothing detected on radar. 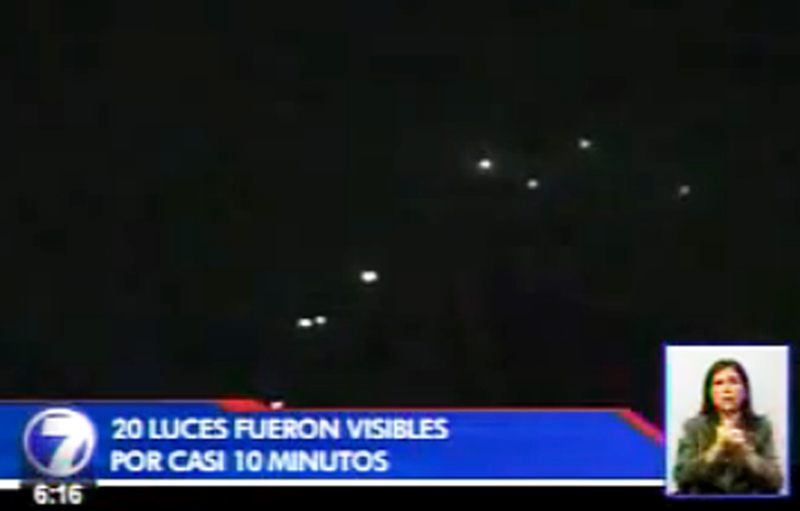 A group of professionals were attending an outdoor activity weekend when at around 8pm on 27 August 2011, they saw a group of lights crossing the night sky above Moravia, on the east side of San José, Costa Rica. The lights – about 20 in all – were in view for some 5-10 minutes, travelling from east to west, sometimes intermittent or flickering, sometimes rotating. The ten eyewitnesses at the Platanares de Moravia event included Marco Vargas, director of the Trauma Unit of the National Children Hospital of Costa Rica, and physicians, professionals and agents of the Organismo de Investigación Judicial (Judicial Investigation). Initially they thought they were watching helicopters, but a phone call to the airport control tower at the Tobias Bolaños international airport in Pavas ruled out aircraft activity. Chinese airline pilots have reported sighting a UFO hundreds of times larger than the moon above Shanghai. 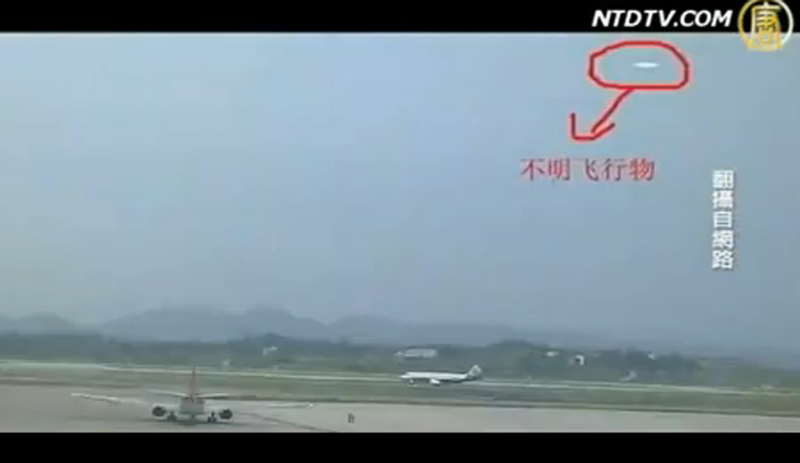 The UFO was so massive that it was seen in Shanghai and Beijing at the same time. 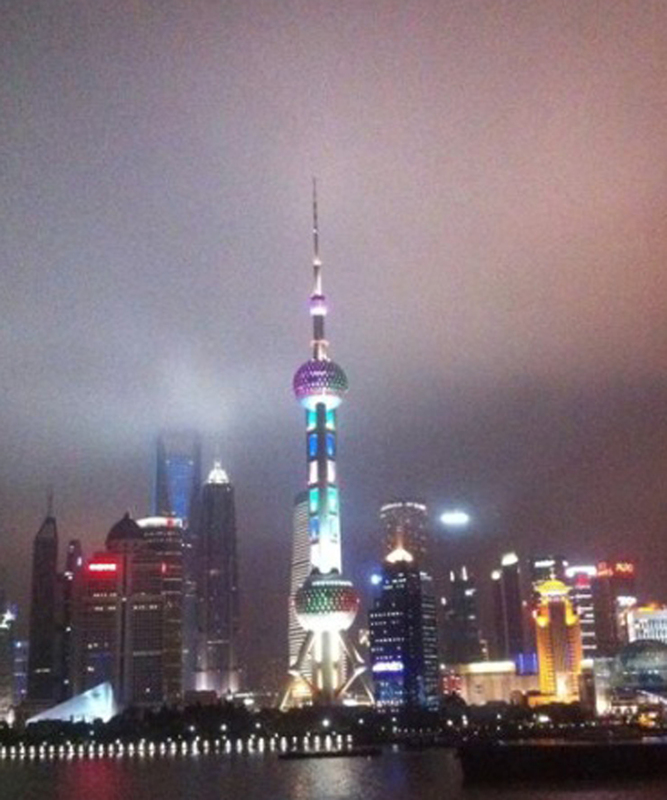 The “colossal unidentified glowing ball” was first sighted around 9pm on 20 August 2011 above Shanghai by a Chinese civil aviation pilot flying China Southern Airlines flight CZ655 from Shanghai to Changchun. “[The object] expanded from small to large and was spherical in shape. It was hundreds of times larger than the moon and its diameter seemed to reach 50 sea miles (92.6 kilometers).” The pilot wrote that the UFO faded gradually after hovering above Shanghai for about 20 minutes. According to the East China Air Traffic Control Bureau, its air control department received similar reports from several pilots on the same day. 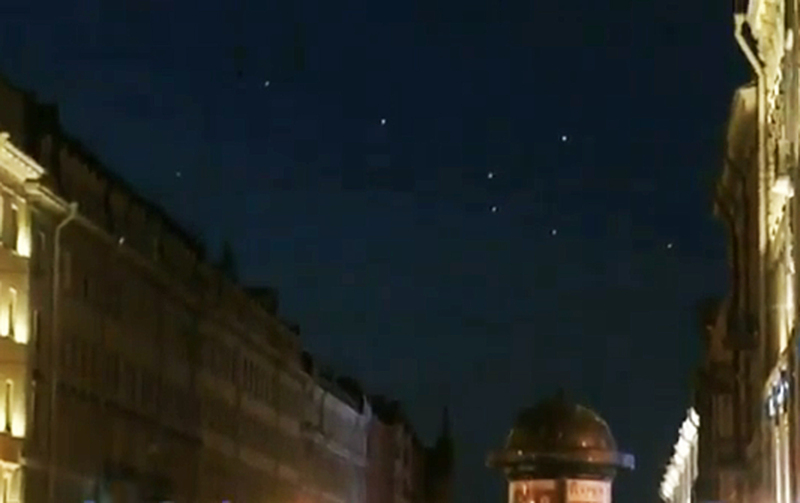 The Xinhua News Agency reported that some 1,500 kilometers north of Shanghai, several amateur astronomers said they spotted a “bubble-like object” above the suburbs of Beijing during a star-gazing event around the same time. 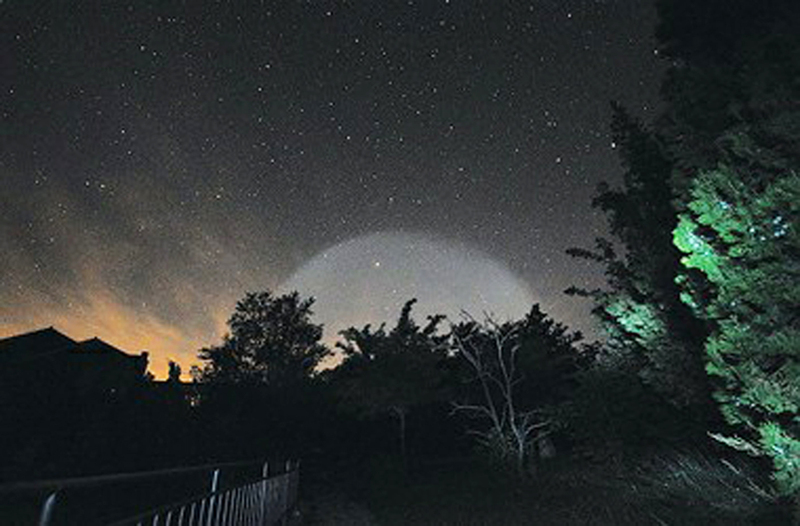 Ma Jing, an engineer with the National Astronomical Observatories, told the Shanghai Daily that he took a set of pictures showing the object rise from the west like an “expanding round white cloud”, but that the object disappeared several minutes later. On 23 August 2011 a UFO was seen and photographed appearing by the famous television tower in Shanghai, China, by the CEO of a well-known Chinese shopping website. On her blog she wrote: “I had visited Shanghai thousands of times, but this is the first time I saw this amazing craft.” She was 100 per cent sure that it wasn’t a helicopter. After more than a year of protests worldwide, new leaders are emerging, especially from Europe and Latin America, who speak with a distinct voice. In Chile, 23-year old Camila Vallejo Dowling has become the second woman to lead the University of Chile’s student union in its 105-year history. When student protests started in May 2011, she quickly became their voice and face, and has led popular protests and cacerolazos (banging pots and pans). Vallejo’s approach is non-violent. She wants the government to assume responsibility for education at the universities which, according to her, are no longer accessible to the general population. “We don’t want violence, our fight is not versus the police or to destroy commercial shops … our fight is to recover the right to education, on that we have been emphatic and clear,” said Vallejo as she stood outside the presidential palace. Chilean students are demanding a new framework for education in their country; in particular, an end to the Chilean school ‘voucher’ system and its replacement by a public education system managed by the state. According to the OECD (Organization for Economic Co-operation and Development), college costs in Chile are among the world’s highest. Chilean economist Marcel Claude has found that student debt is close to 174 per cent of Chilean students’ annual salary upon graduation – and 50 per cent among them are heavily indebted. The following is a summarized report based on an article entitled ‘Speculating with lives: how global investors make money out of hunger’, by Horand Knaup, Michaela Schiessl and Anne Seith, published in the German newspaper Der Spiegel. The world’s food supplies have become a tradeable commodity, as easy to handle as stocks. Banks are now offering agriculture funds to satisfy this growing trend, right on cue. There’s just one small problem – food prices are rising, in parallel to the ravenous demand for agricultural securities. Earlier this year in March 2011, the Food and Agriculture Organization of the United Nations (FAO) reported new record high prices, which even surpassed the prices during the last major food crisis in 2008. The FAO’s Food Price Index indicated that overall food costs rose by 39 per cent within one year. Grain prices went up by 71 per cent, as did prices for cooking oil and fat. The index had reached 234 points in July, only four points below its all-time high in February. There has never been so much money in financial transactions involving agricultural commodities. Agricultural commodities attract investors who are no more interested in grain than they were previously in dot-com companies or subprime mortgages. They range from giant pension funds to small private investors searching for new, safer investment options. But, for the world’s poor, who are forced to spend 70 per cent of their meagre budgets on food, it is life-threatening. More than a billion people are starving worldwide. The current famine in the Horn of Africa is not only the result of drought, civil war and corrupt officials, but is also caused by prohibitively high food prices. The hike in food prices has pushed another 44 million people below the poverty line, reports the World Bank – since June 2011. These are people who must survive on less than $1.25 (€0.87) a day. • decades of neglecting agriculture, especially in hunger-prone regions. Shockingly, while these are all contributing factors they are not responsible for the excessive price hikes. Olivier de Schutter, the United Nations special rapporteur on the right to food, is trying to set the record straight. He asserts that the true culprits are major investors who, as the financial markets have dried up, have invested heavily in the commodities trade, expanding it beyond all proportion. According to de Schutter, excessive speculation is the primary cause of the price increases. Food has become money, has become potential big profits, has become an object of speculation on Wall Street. The United Nations Conference on Trade and Development (UNCTAD) described the process in a recently published study as the transformation of the food market into a financial market. How come hedge funds and investment banks can now affect the costs of bread in Tunisia or corn meal in Kenya? Why can large pension funds and small investors gamble with the world’s food supply? How come the markets in Chicago, New York and London have a decisive role in determining how many people must go without food? The market was strictly regulated, and for good reason, but in 1999 the world of high finance made a number of changes that allowed staple foods to become objects of speculation. To engineer more access the finance industry’s lobbyists got to work, and succeeded in doing so in 1999, when the US Commodities Futures Trading Commission substantially deregulated the futures markets. Banks could now indulge in large trade in commodities securities. In 2004, the US Securities and Exchange Commission (SEC) gave the banks even more scope for action agreeing to a petition by the investment banks Lehman Brothers, Morgan Stanley, Bear Stearns and JP Morgan to relax equity capital rules. From then on, the financial professionals were able to trade with 40 times as much capital as they held in collateral. An unregulated market means the number of speculators making money at the expense of hungry people will continue to grow, says UNCTAD’s chief economist Heiner Flassbeck. The consequences would be devastating. According to the World Bank, an increase of only about 10 per cent in worldwide food prices results in another 10 million people slipping below the poverty line. Even though there is enough food, many die of hunger simply because they can no longer afford to pay for it. The scenes of North Africans protesting worried the powerful. There was talk of “hunger uprisings.” “One could also call them oil uprisings,” says Bettina Engels, an expert in peace and conflict studies at the Otto Suhr Institute of Political Science in Berlin. “The struggle is all about political participation and the redistribution of wealth,” she adds. Witness the fact it is not only the poor but also the middle class who have been taking to the streets in Tunis, Cairo and Tripoli. Even the free-market liberal Guido Westerwelle, Germany’s foreign minister and the former leader of the Free Democratic Party, is now critical of the “irresponsible speculation” in food products. “Between 2006 and 2009, millions of men, women and children suffered from hunger, because the sale of dubious financial products caused food prices to explode,” Westerwelle said during an event at the German Foreign Ministry in May 2011. “For far too long, governments have placed the interests of corporations and powerful elites ahead of the needs of the 7 billion people who produce and consume food,” says Marita Wiggerthale, an agricultural expert with the development organization Oxfam. Today, the portfolios of established commodity funds represent all the key players in agribusiness. For example, Deutsche Bank’s DWS Global Agribusiness Fund and the Allianz RCM Global Resources Fund (which uses the advertising slogan “Promoting Yield Opportunities”) invest in such agriculture multinationals as ADM and Bunge, fertilizer makers like the Potash Corporation and Mosaic, seed producers like Monsanto and Syngenta, and major retailers like Tesco, Safeway and Tyson Foods.